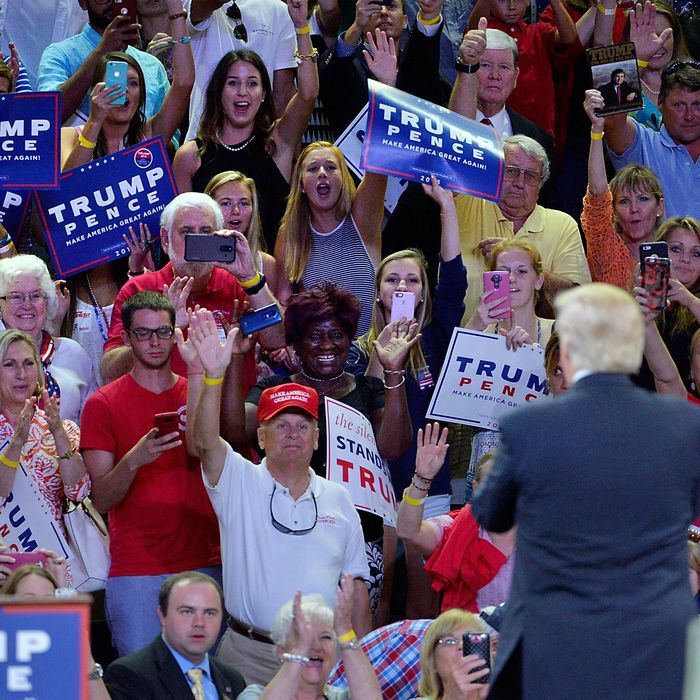 Donald Trump’s much-ballyhooed “outreach to African-Americans” doesn’t seem to be doing him much good among African-Americans, who are inclined to vote for his opponent in proportions nearly matching those achieved by the first African-American president, Barack Obama. There are a couple of reasons Trump’s “outreach” could be not only failing but backfiring. For one thing, he is rather conspicuously conducting it via nearly all-white campaign appearances in nearly all-white communities. Yes, he’s going to Detroit next weekend to attend services at a black church. But he’s not risking an actual speech to the congregants there; he will instead do a one-on-one interview with the church’s televangelist minister. But just as damaging as the medium is Trump’s message itself. Its heart is familiar to those accustomed to conservative agitprop on race: Black folks are dupes for a Democratic Party that has enslaved them on a “plantation” where they give up their freedom and any chance at dignity or equality in exchange for the idle life of welfare beneficiaries. According to this revisionist theory, the modern welfare state is just a continuation of slavery and Jim Crow, with the Democratic Party serving as the continuous oppressor from antebellum days until now, and Republicans offering a continuous option of liberation via self-sufficiency and capitalism. To put it another way, it’s probably not a coincidence that Trump’s view of black people as lazy freedom-despising dependents living in a hellish prison built of their own pathologies happens to coincide with that of white racists everywhere, past and present. Black people do tend to notice that. Tens of millions of black Americans hold the president and his family in high esteem as exemplars of the black community. For them, he deserves respect regardless of your politics. And if there’s anything that defines the GOP in the present age for black voters, it’s the outsized disrespect for Obama, from South Carolina Rep. Joe Wilson’s “you lie” to the birther crusade pursued so vigorously by Trump and others. Black Americans see this, and they remember. Observers who are mystified by Trump’s low standing among African-Americans do not seem to grasp the deeply racist subtext of birtherism: that the first African-American president must by definition be an “alien” and the product of a white-hating, “anti-colonialist” point of view, injected into the mainstream of U.S. politics by subterfuge. That first impression of Trump as a political figure was searing and enduring for voters who are intensely proud of Obama and what he represents. So the failure of Trump’s “African-American outreach” so far is not very surprising; when you talk smack about people to their suspected despisers (conservative white voters) and then aggressively peddle a theory that reduces them to an easily duped collection of scary predators and helpless dependents, they do not respond well. The transparent nature of the whole exercise may even be apparent to its actual target: white voters who are made uneasy by the white identity politics Trump has so notably championed.